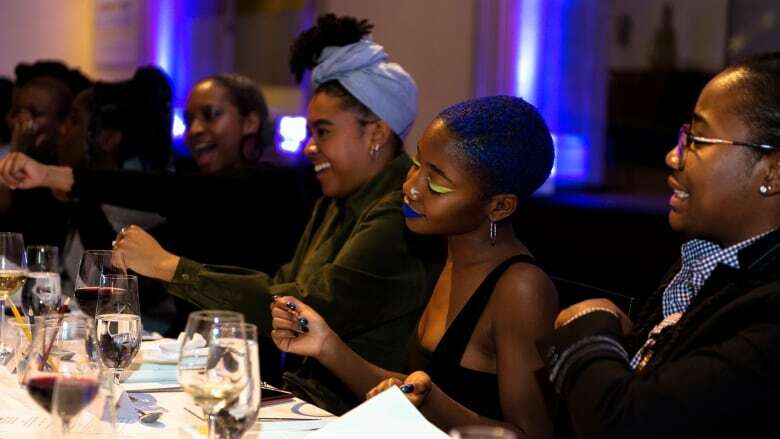 The Feast brought together Black women and gender non-conforming artists to commemorate how far we've come — and where we can go. On January 25th, I sat in the Art Gallery of Ontario on a Mickalene Thomas-designed rug, feeling like I'd snuck into an exclusive event. 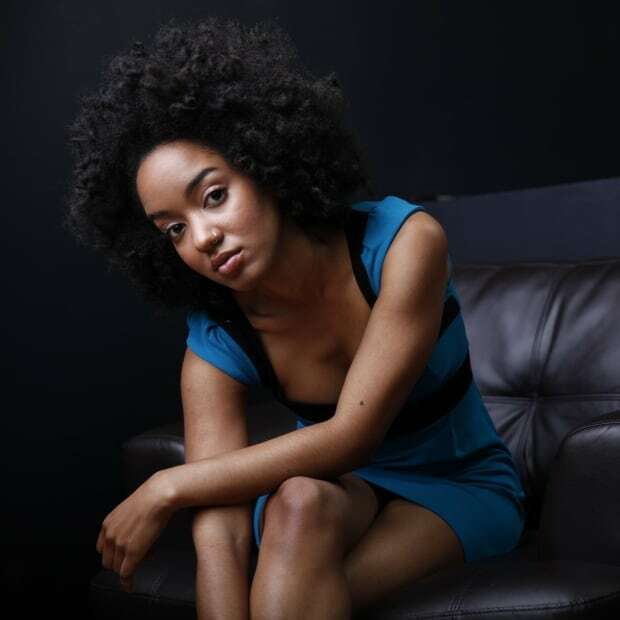 I recall whispering with Soulpepper Theatre's artistic director Weyni Mengesha, taking selfies with dancer Akua Delfish and admiring the outfit of filmmaker and installation artist Michele Pearson Clarke as we waited for a group photo. 100 Black women and gender non-conforming artists were being positioned and lights were being arranged so that each face could be made visible to a single camera lens. I remember patiently waiting for the photographer Ebti Nabag and her team to say they were ready when I was suddenly overcome by a wave of emotion. The historic magnitude of the moment and the weight of its significance brought tears to my eyes before I could remember that I wasn't wearing waterproof mascara: we were all gathered in one of the largest art institutions in this country to proclaim, affirm and celebrate our existence as creatives and producers of culture in Canada. 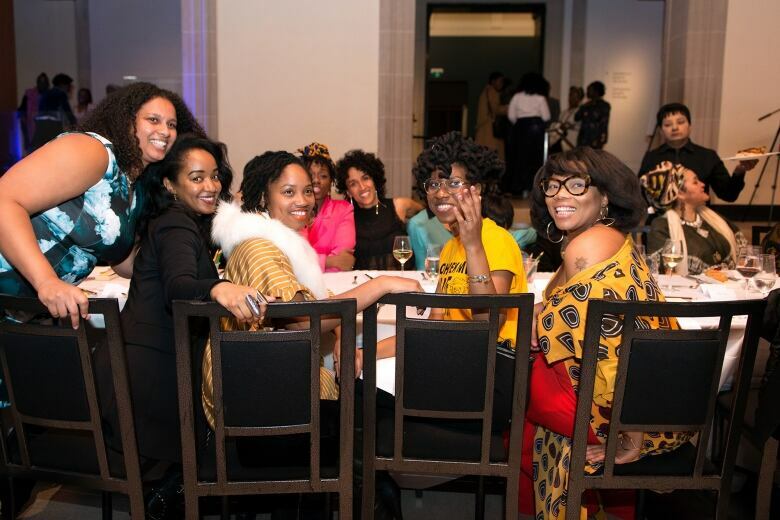 The event was called The Feast: A Gathering of 100 Black Wimmin Artists and it was put together by Black Wimmin Artists (BWA), a collective I'm a part of that currently has over 150 members from across Canada. The Feast was the first in-person meeting since the group's inception as a WhatsApp group chat. Visual artist and arts convenor Anique Jordan initiated the virtual community in 2016. I spoke with her and the BWA advisory team a few hours before the event: "It started with sharing ways that we can access opportunities, celebrating each other." In the group chat, members frequently share calls for proposals, job offerings, discount theatre tickets, funding ideas and good news. Jordan describes it this way: "It kind of became like a pocket posse of love and support and of really affirming over and over and over again that we are deserving of being artists, that it is a legitimate professional choice, that you can survive doing that and that there's a community that will support and witness that kind of emergence." Two years after the collective's inception, members began requesting an in-person meet up. An advisory team was formed and ideas were brainstormed. 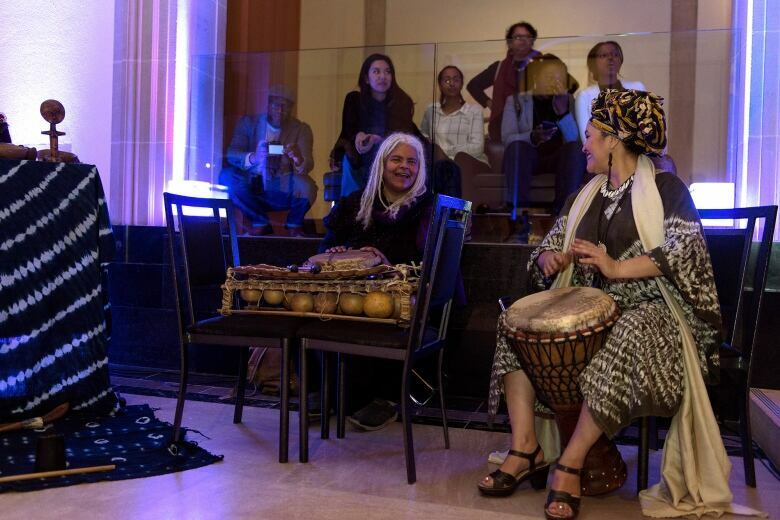 It could have been a potluck in a living room or a barbecue at a community arts centre — but when curator Julie Crooks invited the group to hold it at the Art Gallery of Ontario, the thinking around the first meeting began to take on a different scope. "[We talked about] the question of intention, of what our bodies would represent within this space," Jordan tells me. "[We were] thinking about a continued visibility, a type of infiltration, a type of commanding our own presence." Almost 30 years to the date before The Feast, another collective of Black women artists in Toronto also gathered and asserted their presence in a Toronto gallery. 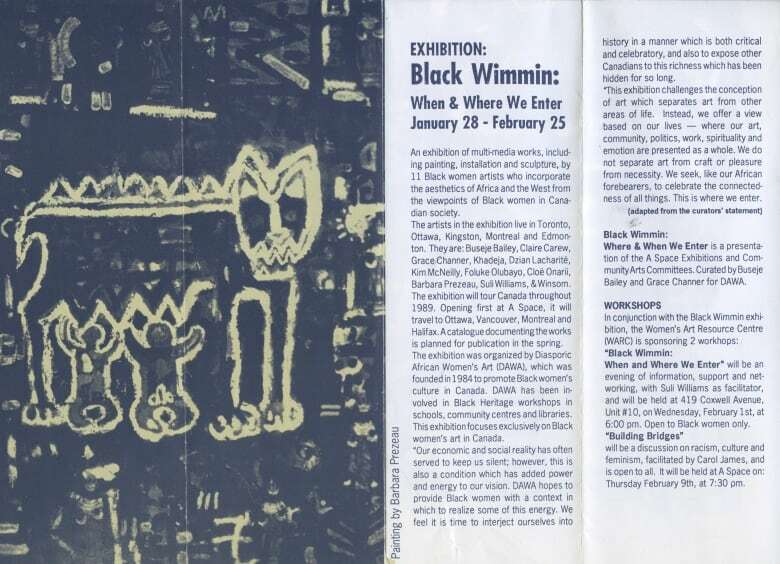 On Jan. 28, 1989 the Diasporic African Womyn's Art (DAWA) collective opened their exhibition Black Wimmin: When & Where We Enter at A Space Gallery. It would prove a historic occasion as the first exhibition of Black women artists in Canada. However, it's not an occasion that has made its way into most art history classes. As a result, it was only when Jordan was doing research for The Feast that she first learned of this exhibit and the work of DAWA. And when she and the advisory team realized that The Feast would fall so close to the 30 year anniversary of the exhibition's opening, they took it as a sign. The event was connected to a deeper historical context, and as BWA advisory member Najla Edwards told me, this fact was a cause for reflection. "We're not the first Black women artists in Canada," she says. "People have done many things before us." The parallels between Toronto in the '80s and today are striking, and the lessons that can be gleaned from that period are poignant. It was a time that saw the rise of what arts scholar Dr. Andrea Fatona called a "Black cultural movement." Artists were developing their creative practices while also organizing against apartheid in South Africa, debating feminist theory within and outside the academy and battling the local realities of police brutality and anti-Black racism in education, housing and employment. Sound familiar? The racist and exclusionary practices of major art institutions were also a major focus of organizing. I asked DAWA member Grace Channer about the era over email. "In the 1980s, institutional critique was a burgeoning issue that many artists of colour were engaged in. Although Canada was populated by immigrants and First Nations, the metanarrative of 'Canadian culture' defined a Canadian artist as white and male. Everyone else could only be other. Artists of colour were not taken seriously. They were not promoted by major institutions who primarily forwarded a Eurocentric cultural view at the time." In 1989, Black artists in Toronto mobilized protests against the racist Into the Heart of Africa exhibition at the Royal Ontario Museum. They again organized a protest for the 54th annual PEN gala at Roy Thomson Hall due to the conferences' exclusion of writers of colour. But rather than waiting for these institutions to open their doors, Black artists formed their own artistic collectives and organizations including Canadian Black Artists in Action (CAN: BAIA), the Black Arts of Canada Committee and DAWA. DAWA was founded in 1984 by Channer, Buseje Bailey, Foluké Olubaiyu, Pauline Peters and Dzi..An (Dzian Lacharatié). The acronym DAWA means "medicine" in Kiswahili. "I see that as a powerful metaphor that reflects the understanding of a need for healing and the vision that DAWA could provide that space for Black womxn artists," DAWA member Mosa McNeilly writes to me. "The group was created out of necessity," Buseje Bailey emphasizes over email. "We were a group of Black artists with no venues to display our art, and the venues we approached found our output of our cultural production valueless." 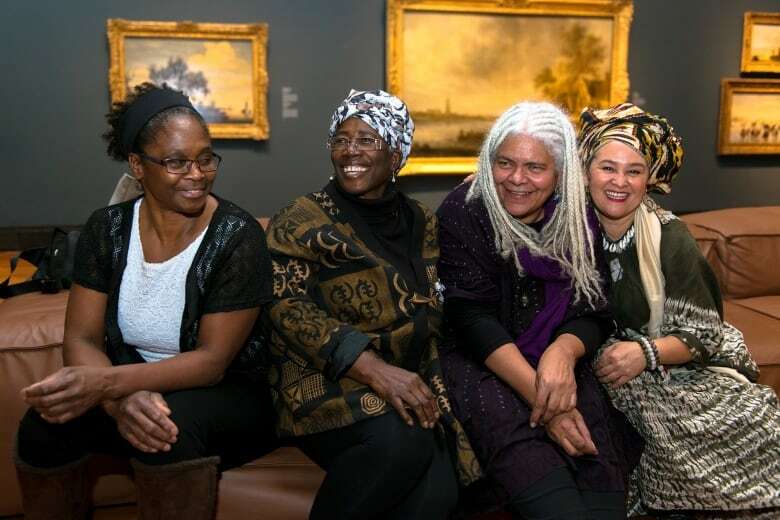 As a result, they created the exhibition Black Wimmin: When & Where We Enter. The show featured the works of the founding members plus art by McNeilly, Khadejha, Chloë Onari, Barbara Prézeau Stephenson, Suli Williams and Winsom. "We were ready to chart the cartography of Black women's artistic practice across the country," Channer writes. Utilizing an African-centred, diasporic and feminist framework to guide their approach, the 11 participating artists chose not to rely on a single curator. Instead, they collaborated on the installation, designating a different participating artist to take the lead in directing and mounting the works in each location. The exhibition travelled across the country and was shown at gallery spaces in Ottawa, Victoria, Montreal and Halifax. "To artistic grassroots communities, we achieved our goals by producing, owning and naming our artistic sensibility," Bailey tells me. "The established art institutions, however, are a hard nut to crack." Winsom was one of the artists exhibited 30 years ago and today several of her installations are on display in the J.S. McLean Centre for Indigenous and Canadian Art at the AGO. Last year, eight pieces of June Clark's work were also on display in the same gallery. On the night of The Feast, Sandra Brewster's solo exhibition Token | Contemporary Ongoing opened at the A Space Gallery — the same site DAWA used for their Toronto opening three decades earlier. These solo exhibitions are moments to celebrate, but data shows us that these examples are exceptions to the rule and not a sign of systemic change. A Canadian Art study revealed that only 3 per cent of solo exhibitions held at major art institutions between 2013 and 2015 across Canada were by non-white female artists. White male artists accounted for 56 per cent. In the case of the Art Gallery of Ontario, Mickalene Thomas is only the second Black woman to receive a major solo exhibition. Thomas is African-American and the other artist the AGO featured, Wangechi Mutu, is Kenyan-American. To date, no Black Canadian female artist has ever had a major solo exhibition at the AGO. At The Feast, four of the original organizing members of DAWA were honoured by BWA for their work, their perseverance and the vision that led to the creation of the exhibition 30 years ago. I asked each of them how it felt to be recognized. "To be honoured by my own community of Black womxn artists has been a fortifying and galvanizing experience for me," writes McNeilly. "It feels like a homecoming. It affirms that I belong to a community and that all these years of dedicated labour has value to the community I serve. And yet, it is bittersweet. Looking back, taking stock of the 30 years that have passed since the beginning of my career, I recognize that I have missed out on milestones that mark the evolution of an artist's practice and I see that some of those missing links are due to systemic barriers I have faced." 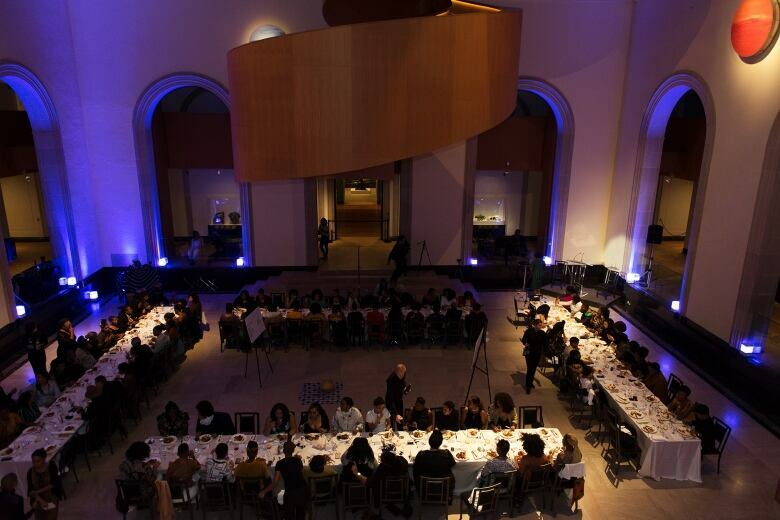 100 Black women and gender non-conforming artists were served a three-course meal while sitting in Walker Court, the heart of the AGO. Family, friends, collaborators and gallery patrons gathered on the outskirts of the hall as witnesses to the moment, tasked with documenting and holding the memory of this historic occasion. I sat beside dub poet and professor Lillian Allen and across from DJ L'Oqenz, eating good food, drinking too much wine and smiling so hard that my face hurt by the end of the night. It was a powerful experience — one that reminded me of the brilliance of my peers, the power in our collectivity and the badass bravery of those who laid the foundation. And yet when I arrived home, a fear that had been lying dormant all evening moved its way into the forefront of my thoughts. It's a fear every Black artist in Canada knows well: does this moment of joy, of affirmation, of undeniable success, signal transformative change? Or, 30 years from now, will white male rule still be the standard in the Canadian art world? Will we still be expected to fight?